Every major English-speaking study destination has a keen interest in international student enrolment in its Intensive English Programmes (IEPs). IEPs are both a significant international education segment in their own right, and an important indicator of overall enrolment trends, as many IEP students will continue to further studies in the host country after their language programmes. IEPs in the United States have seen mostly steady growth since the worst of the enrolment declines that followed the 9/11 attacks in 2001. However, recent changes to scholarship support for Saudi Arabian students, and other forthcoming developments within and outside the US, are creating both new challenges and new opportunities for Intensive English Programmes in America. Saudi Arabia is currently the leading sending country for IEPs in the US. Since the implementation of the King Abdullah Scholarship Programme (KASP) in 2005, the Saudi government has sent tens of thousands of students to the US, many of which needed extensive English training before being able to undertake university studies. 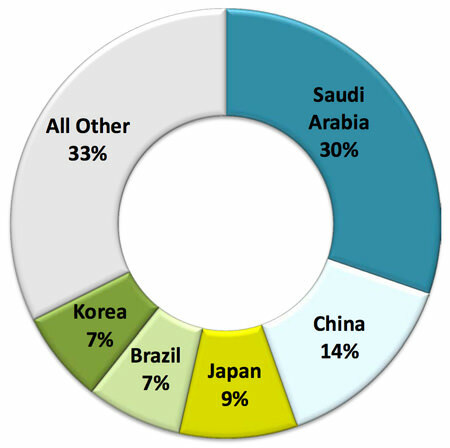 According to the IIE’s Open Doors data on Intensive English Programmes in the US, Saudi Arabians numbered at 38,165 which accounted for just over 30% of the total IEP enrolment of 125,973 for 2013 – more than double the number of students from second-ranked China. As the following chart illustrates, two thirds of IEP students in the US come from just five source countries. In addition to these impressive numbers, Saudi students also typically enrol for longer periods of language study – nearly 19 weeks on average compared to an overall average of under 15 weeks among IEP students in the US – making their recruitment and retention an even more important consideration for many programmes. The KASP programme as currently structured provides for full scholarship support (that is, both tuition and living expenses) for one year of intensive English training. The term of study may be extended to 18 months and accompanying family members may also undertake English studies with scholarship support. This is a significant feature as female scholarship recipients must be accompanied by a family member, and many of the male recipients are accompanied by spouses who also wish to pursue language training. There is no minimum English level required for the scholarship, and so students with minimal language skills generally require extended language studies before they are able to proceed to their academic programmes. It appears, however, that important changes are now afoot in terms of the level of support available for language study. The Saudi Arabian Cultural Mission (SACM) oversees KASP in the US and, in spring 2015, it conducted a review of all IEPs receiving Saudi scholarship students. The immediate impact of the review was that some programmes were asked to adjust their schedules (i.e., days and times of classes per week and total length of programme cycles) and to comply with new requirements for attendance records and reporting. Saudi officials also alerted IEPs to further pending changes to the scholarship programme during the review period. And later in the spring, information began surfacing regarding several substantive changes for new scholarship programme recipients – most significantly, the reported introduction of a new six-month limit on funding for pre-academic language training. SACM has also reportedly introduced an important change with respect to student placement in IEPs. In the past, students could “self-place” in any language programme – that is, those schools that recruited in Saudi Arabia could enrol students who would then obtain the scholarship. However, under the proposed changes all scholarship-supported IEP students are to be placed by the Saudi government. The clear implication is that future KASP recipients will be expected to demonstrate a higher level of English proficiency, and that they will then be placed in American IEPs at the discretion of the Saudi Cultural Mission. Although we were unable to receive official verification directly from SACM prior to publication, frequent reports of these new measures have spread in recent months through communications with Saudi students and between IEP administrators and Saudi officials. Official statements do not speak to the question of funding for language studies, but do highlight the fact that 40,000 scholarships will be provided in the next KASP cycle (Phase III). Media reports indicate that Phase III (applications for which opened at the end of June 2015) will focus on current public-sector employees as well as candidates who have a job offer from a governmental organisation, with the idea that scholarship recipients will have a secured job on their return to Saudi Arabia. While KASP appears to be reducing its support for intensive language study, other markets are stepping up their efforts to build language capacity among their international students. Kuwait, for example, provides extensive scholarship opportunities. While the Kuwaiti numbers come nowhere close to the top-ranked Saudis or Chinese, the small, oil-rich nation ranked seventh in population counts in the 2013 IIE Open Doors data. Kuwait was by far the fastest-growing source market for US IEPs that year, far exceeding any other country, with growth of 54.8% from 2012 to 2013. 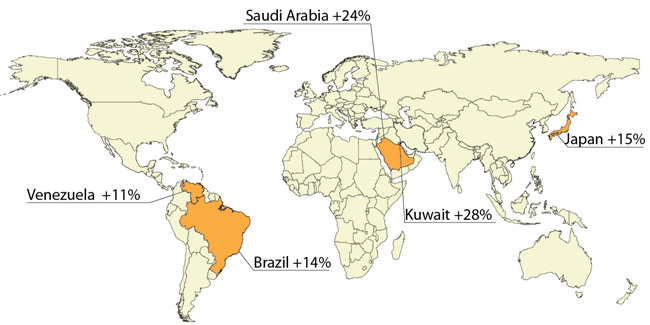 When looking at 2013 to 2014 growth, Kuwait registered a 28.2% increase in the number of students enrolled in intensive English programmes in higher education. Meanwhile, as the map below shows, intensive English enrolments were up from other nations as well. More proximate to the US, Brazil and Mexico have both recently undertaken ambitious programmes that have led to more students joining language programmes. Brazil began its Science without Borders in 2011, with the goal of sending more than 100,000 STEM-focused students abroad. The programme, renewed for another round of scholarships in 2014, is administered in the US by IIE and allows for up to six months of language training prior to full-time studies at either the undergraduate or graduate level. Science without Borders was the main reason that Brazil’s student numbers grew by over 20% in the 2013 IIE Open Doors report, making it the fourth-ranked source market for American IEPs, just after Japan. According to IIE, 217 IEPs hosted a combined 8,003 students through this important mobility programme in 2014. And as we noted earlier this year, the Mexican government aims to send as many as 18,000 of its citizens to participate in ESL-related programmes (including TESL training and English for specific purposes) as part of the 100,000 Strong in the Americas programme introduced in conjunction with the US Department of State in 2013. Long-time IEP directors in the US are well aware of the ebb and flow of student populations over time, having seen various cycles of growth and contraction in the past with Iranian and Venezuelan students, then Japanese and Korean, and now Saudi and possibly soon more Brazilian and Mexican students. The changing tides of global economies and policies, and the growing desire of nations around the world to internationalise, will no doubt continue to drive these shifting enrolment patterns in the US in the future. In the process, they will also continue to create new opportunities and new challenges for America’s Intensive English Programmes. This entry was posted in Agents, Higher Education, Language Learning, Middle East, Most Popular, North America, Regions, Saudi Arabia, United States and tagged language test, student enrolment, language schools, language travel industry, Most Popular.